A French couple have found a hoard of gold coins worth at least 100,000 euros (£89,000; $140,000) in the cellar of their home in the town of Millau. They were working on their drains when they dug up the 34 coins in a little clay pot, French media said. 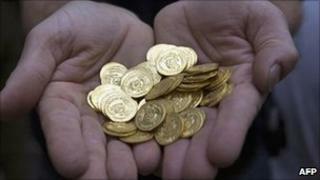 The coins date from 1595 to the French Revolution, which began in 1789, said a local coin expert who evaluated them. The most valuable is a double louis from 1640, during the reign of Louis XIII, worth 6,500 euros. The coin expert, Marc Aigouy, told AFP news agency that he offered either to buy the coins from the couple or to organise an auction on their behalf. He said if American and Japanese buyers participated, the coins could fetch at least 100,000 euros. Mr Aigouy said the couple wish to remain anonymous but they live on rue Droite, an old Roman road which is the oldest street in Millau, in southern France. Under French law, the couple are allowed to keep the treasure because it was found on their own property, Mr Aigouy said.